For the last four weeks, the name of the game for Curiosity has been driving. But these weeks of driving have been more challenging than they used to be. Four of the drives in those last four weeks have ended unexpectedly early due to one problem or another, and the lack of images returned so far from sol 697 suggests another something happened this week. The shortened drives were on sols 672, 676, 677, and 683. In the most recent two weeks the planned drive distances have also been much shorter than previously, 20-ish as opposed to 100-ish meters. That's because Curiosity is now picking her way over the very worst kind of terrain for her wheels, a plateau of resistant caprock that has been eroded into pointy shark's-tooth shapes by eons of wind. But she's almost arrived at "Hidden Valley," where she'll finally get her wheels back on to softer sand. Here's the latest view from Curiosity, sol 696 (two days ago), looking over pointy rocks toward Hidden Valley. 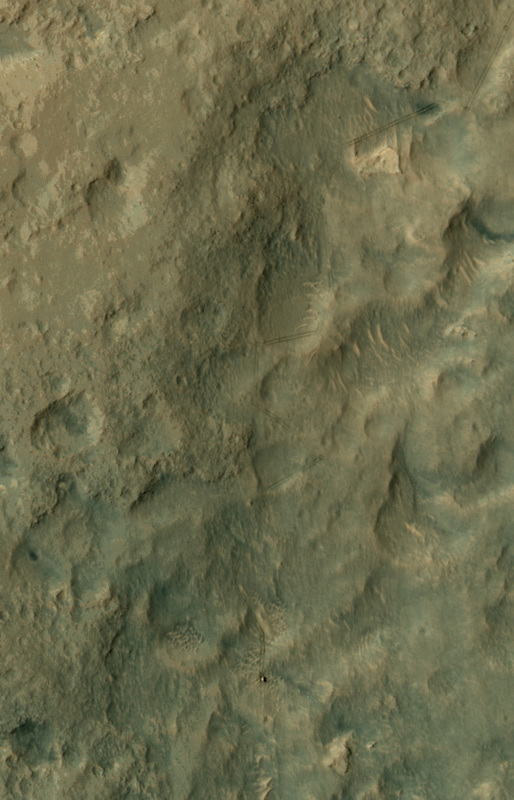 Beyond the lighter sand-filled Hidden Valley is the nearest of the black basaltic sand dunes that stand as a barrier between Curiosity and Mount Sharp. Once she enters Hidden Valley, Curiosity will turn right to parallel the sand dunes for several kilometers. The view ahead of Curiosity on sol 696 (July 22, 2014) includes daunting pointy rocks but also the sand-filled Hidden Valley that should provide much safer terrain. 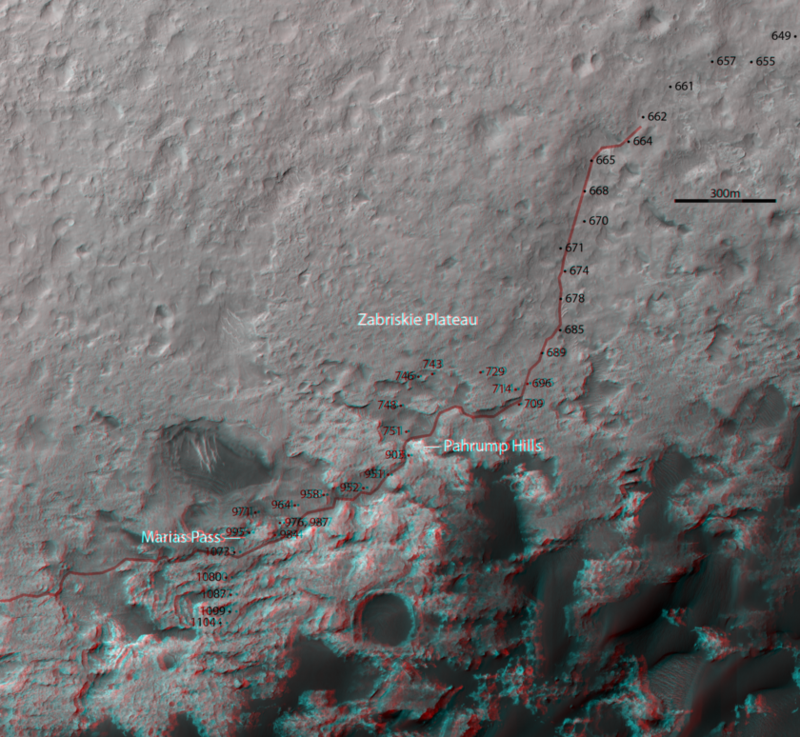 Here is a view of the recent route in 3D. Grab your red-blue glasses! You can see how the last two weeks of driving have taken Curiosity up onto this plateau of nasty resistant rock, but she's almost to the edge of the valley. And it does seem to have a little edge; getting down into the valley may take some careful path planning. The positions on these maps are based on the outstanding work being done by Phil Stooke over at unmannedspaceflight.com. Here's a closer 3D look at the upcoming terrain. Hidden Valley is at upper right. This should make for some very pretty views over the coming months -- that caprock makes a resistant ledge that forms buttes and ridges. Unfortunately, those same ridges will make Curiosity's horizon rather close. Now to look at the past four weeks in more detail. It's easy to do so, now, thanks to the resumption of the USGS Astrogeology blog. Ken Herkenhoff, Ryan Anderson, and Lauren Edgar have been doing a great job with updates on rover activities; I'll embed their reports below. After a 107 m drive on sol 670, we are now in Shoshone quad, and just 160 m from the edge of the landing ellipse! The sol 671 plan is a lot like the sol 670 plan, with a 3 hour drive as the main activity. These long drives often use visual odometry, where the rover takes pictures along the way to monitor how the drive is going and avoid obstacles. This is a great capability, allowing us to drive farther than we could otherwise, but a side effect is that it produces a lot of data. The result: less data available for science observations. All of which is to say that today was another data-constrained sol. There’s always a way to squeeze some science in though! Today’s plan has a color stereo image of a rock dubbed Lost Burro, a ChemCam passive observation of the sky, and a NavCam movie of the sky looking for clouds. (Passive means that we don’t fire the laser, we just passively collect the spectrum of the target.) We also managed to squeeze a ChemCam measurement of our titanium calibration target and a MAHLI end-of-drive stowed image between the orbiter communication passes. And of course, we always do routine environmental monitoring with RAD, REMS, and DAN. Plus, after each drive we take clast survey images of the ground with Mastcam. Not bad for a data-constrained sol! Today we honored the contributions of women on the MSL team, with 75% of the operations roles filled by women! I was on duty as the Geology and Mineralogy Science Theme Lead, and it was an exciting day of planning. Curiosity has just entered the Shoshone quad, and our top priority is driving. The Sol 672 plan includes ChemCam and Mastcam observations to characterize the local geology (with the appropriately named Mountain Girl target), a drive, and some post-drive imaging to prepare for targeting over the weekend. The plan also includes some routine environmental monitoring. Hopefully with the drive on Sol 672 we will reach the edge of the landing ellipse, which will be a major milestone. Thanks to all of the women (and men) who continue to explore Mars! I'm MAHLI/MARDI uplink lead today, planning Sols 673-675 to get MSL through the weekend. It turned out to be a busy day, as the Sol 672 did not complete nominally. A 101-meter drive was planned, but after traversing 82 meters the rover stopped because it determined that it was slipping too much. 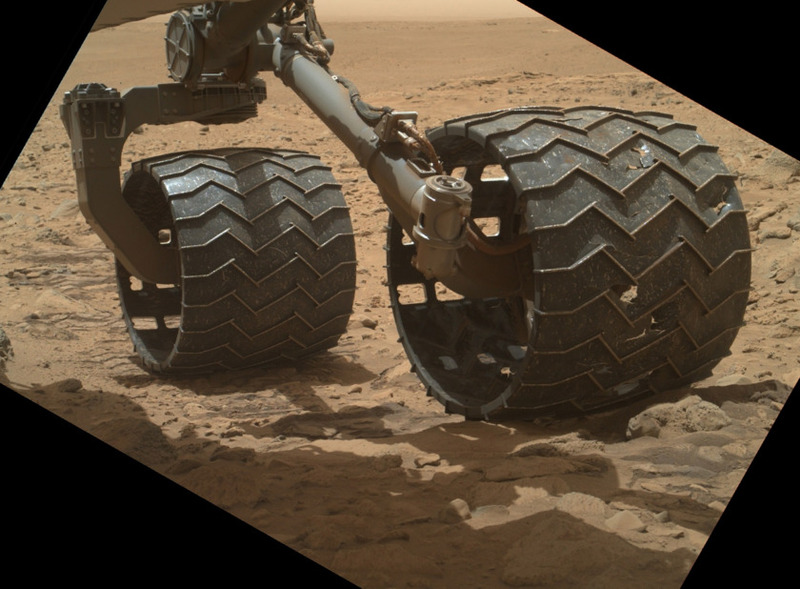 As the vehicle was crossing some sandy ripples, the wheels encountered soft sand and the rover automatically detected that progress was not being made at the expected rate, and correctly halted the drive. Coincidentally, the rover stopped right on the landing ellipse, a major mission milestone! The vehicle was designed to be able to traverse far enough to drive out of the region defined by the uncertainty in the landing location, and has now achieved that laudable goal. We had been planning to acquire a full set of wheel images on Sol 673, but the current rover location is not suitable for this activity, so we decided to plan contact science instead. MAHLI images of a target Sourdough will be taken before placing the APXS on it and integrating overnight, in parallel with SAM scrubber cleaning. On Sol 674, the rover will drive out of the ripple, then turn around to get a better look at the location it is at now. The plan for the final sol (675) is dominated by cleaning of SAM's getter and trap. The sol 672 slipping episode is a good example of how the Curiosity team has learned well from Spirit and Opportunity how not to get embedded in sand. Of course it would be better if they didn't have to drive over sandy ripples at all, or if they could predict better which ones would be super easy to cross and which would cause slippage; but sand is better for the wheels, slippery or not. It's easy to see that the rover was slipping, because of the holes that were intentionally cut into the wheels. Those holes leave little piles of sand in Curiosity's tracks as she drives. The sand piles get narrower, stacking up on each other, as the forward progress of the wheels decreases. 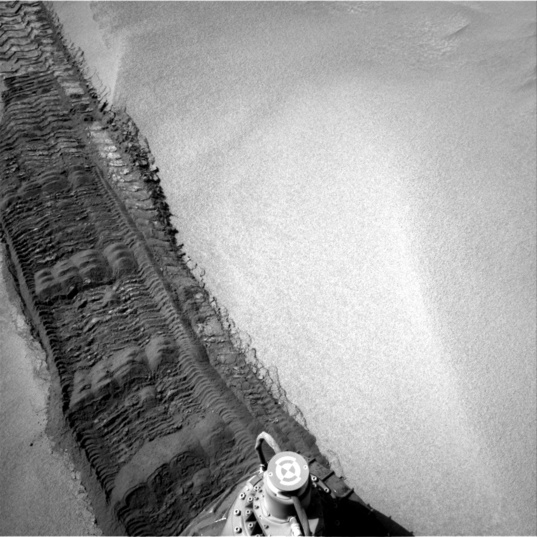 Curiosity left these tracks on sol 674 after backing out of a small ripple field in which her wheels had previously slipped. 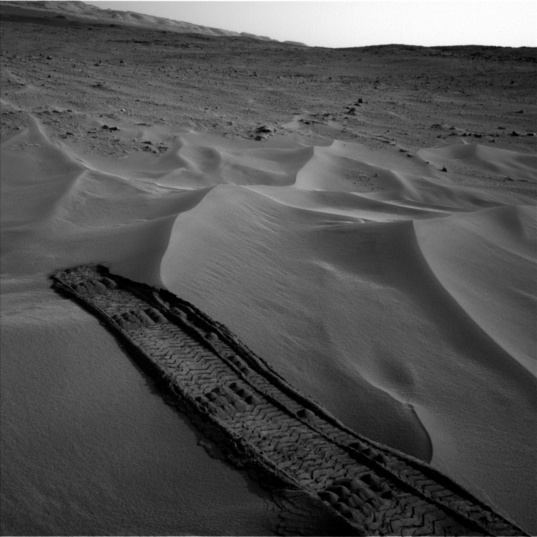 Last weekend, MSL successfully backed out of the sandy ripple, pausing to image her tracks. So more driving toward Mt. Sharp is planned for this week. Because of the phasing between Earth and Mars time, we are planning rapid-traverse sols, in which the entire uplink process is completed in only 7 hours. The Sol 675 data were not received until almost 13:00 Pacific time, as expected. Therefore, the uplink team had to work later than usual to plan a ChemCam and Mastcam observation of a ripple target named Radcliff, and -- more importantly -- another drive. The Sol 676 drive halted after about 16 meters of progress (out of ~39 m planned) because the rover's yaw diverged too much from the commanded heading. Otherwise, all activities completed as planned and the rover is healthy. 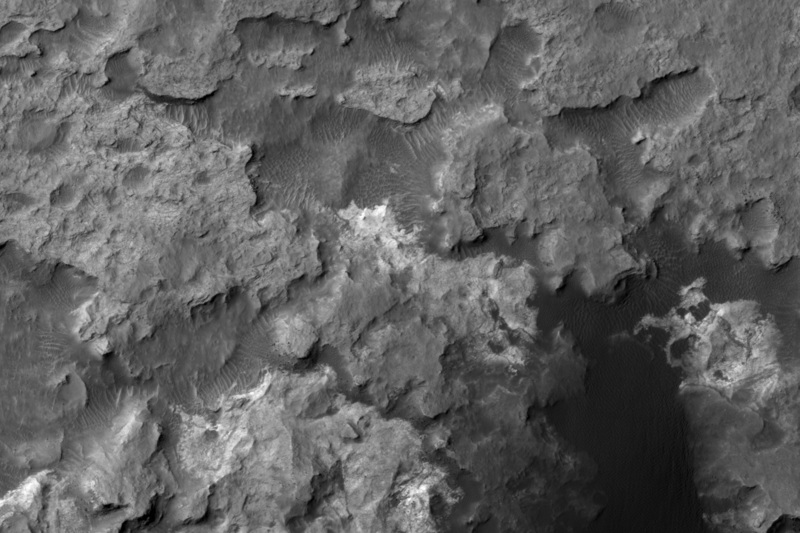 So another rapid-traverse drive is planned for Sol 677, preceded by ChemCam and Mastcam observations of a bright linear feature dubbed Worldbeater along the edge of the rock outcrop to the left of center in this Navcam image. The Sol 677 drive was stopped after almost 20 meters (out of 57 m planned) by the autonomous navigation software, when it detected an obstacle more than 20 cm high. But the rover is healthy and acquired the post-drive data as planned, including Navcam images showing the rover tracks into the ripples where it got stuck, then backed out and around them. The Sol 677 post-drive data did not arrive until almost 14:00 Pacific time, so Sol 678 is being planned on the rapid-traverse timeline. Before the drive, Mastcam images of targets Tin Mountain, Ryan, and Argenta will be acquired. The sol 678 drive was successful! We traversed 66.5 meters, ending our drive right where we expected near some picturesque wind-blown ripples. Looking at these ripples in orbital HiRISE images, you might think they were big sand dunes, but in truth they aren’t very tall at all. On sol 679, we have some Mastcam observations of the ripples and a drive direction Mastcam mosaic, followed by MAHLI imaging of the wheels. The rest of the weekend, the rover will be in a planned runout mode, where it automatically executes a set of simple commands, allowing the team to enjoy the 4th of July weekend. RAD and REMS will continue their environmental monitoring during the runout, but the other science instruments will be off. Curiosity will be ready and waiting to do more driving and science on Monday! The imaging of the rover wheels went well last weekend, and we are ready to drive again on Sol 683. After taking a couple Mastcam mosaics of targets Tecopa and Billie, the rover will drive across one of the nearby ripples and take a lot of Hazcam and Navcam images to see how the vehicle performs in the loose sand. Analysis of the data acquired during this ripple driving test will be useful in future traverse planning. I'm MAHLI/MARDI uplink lead today, planning the usual post-drive MAHLI stowed image and MARDI twilight image. NASA / JPL / "Gerald"
On sol 683 (July 8, 2014), Curiosity took many Hazcam images while performing a test drive over a sand ripple. On Sol 683 Curiosity drove across a ripple to see how the vehicle performs in the loose sand. Today we are planning Sol 684, which is a restricted sol (meaning we don’t have all of the data down from 683 in order to plan another drive), and it’s also a very constrained sol in terms of available power. So it will be a light sol in terms of science (only some data management activities and standard environmental monitoring), but this way we’ll be able to have more time for science and driving in the Sol 685 plan. So we’ll recharge today and look forward to another long drive tomorrow! Today we are planning Sol 685, which includes a short pre-drive science block, 2.5 hours of driving, and some post-drive imaging for targeting. The pre-drive science block contains some environmental monitoring including ChemCam passive spectroscopy of atmospheric composition and a Mastcam measurement of atmospheric dust opacity. Since we are still driving through a lot of loose sand, we expect that the drive will cover a distance of ~60 m. Once we get through this area of ripples we’ll drive up onto the Zabriskie Plateau, named after a sandstone near Shoshone, California. Tomorrow will be another restricted sol as we wait for data to come down, and then we’re looking forward to possible contact science and more driving over the weekend! The sol 683 drive was cut a bit short because the rover yaw exceeded the specified limits for the drive, which is a fancy way of saying that the rover steered away from its planned route to avoid an obstacle. The rover drivers tell the rover to stop when a drive deviates too far from the planned direction so that they can check and make sure everything is ok. The good news is: the rover is healthy and we’re planning another drive on sol 685. Before we drive, we will do a quick Mastcam observation of the sun and a ChemCam passive sky observation. After the drive we will do our standard post-drive imaging. Then, on sol 686 we will do a blind ChemCam observation with an accompanying Mastcam image. (We can’t drive on sol 686 because we don’t know how the sol 685 drive went). Today we received data from sol 685, showing that we drove 60.4 meters, and the rover is busy doing its sol 686 activities right now. Today we are planning sols 687 and 688 to cover the weekend (Sunday is a soliday, which is a day without planning to allow Earth and Mars schedules to sync back up). We’re trying something special in the sol 687 plan: MAHLI is going to capture a picture of the plasma plume generated when ChemCam zaps a rock! Because of the low atmospheric pressure on Mars, the spark of plasma generated when ChemCam’s laser zaps a rock is larger and brighter than it would be on Earth. This is a complicated activity that has required lots of pre-planning but hopefully it will show a nice bright spark. After ChemCam zaps the rock (dubbed Nova), and MAHLI catches it in the act, we will take advantage of the fact that the rover’s arm is already out and place the APXS on the rock to do an overnight integration. Then, on sol 688, we will do another drive. Meanwhile, most of the Mars scientists on the team are getting ready to head to the 8th International Conference on Mars next week (it’s actually in Pasadena, California, not on Mars). The rover will be doing rapid traverse sols next week so the plans will be light on science and focused on driving. Your blogging team will also be in Pasadena, so we won’t be able to do our daily Curiosity updates here, but we will try to put up a few brief posts about some of the interesting Mars science at the conference! I'm editing out the notes on the 8th International Mars Science Conference for the sol 689 to 695, just sticking with the Curiosity updates in the USGS posts. I have a couple of guest posts coming soon about that conference, so stay tuned. Many of the scientists on the MSL team are attending the 8th International Mars Science Conference this week ....With all this going on, I wasn't able to keep up with MSL operations, but my review of the latest project reports shows that the rover drove over 82 meters last weekend. The Sol 689 drive will be more limited because the terrain ahead is rough. Curiosity completed a short 9.6 meter drive on sol 689 as expected. For Sol 690 uplink, there was limited time for science but the team managed to fit a ChemCam observation of the target Reed before the drive. Some of the MAHLI images taken during the Sol 687 ChemCam LIBS measurements of Nova captured the plasma generated by the laser! The Sol 690 drive completed as planned, totaling nearly 30 meters over relatively rough terrain. Another rapid-traverse sol was planned today, with ChemCam and Mastcam observations of a bright rock dubbed "Limekiln" before the drive. Here is the cool video of that plasma! MSL's Sol 691 drive was successful (almost 24 meters), and the Sol 692 plan included ChemCam and Mastcam observations of the target Pyramid Hills before another drive. There isn't time today to plan 3 sols of activities before commands for Sol 693 must be sent to the rover, so no activities are being planned for Sol 693. The plan for Sols 694 includes MAHLI and APXS observations of South Park, ChemCam of Johnnie and Mastcam images of both targets. Another drive is then planned for Sol 695, followed by the standard post-drive imaging. The target rocks are part of the resistant unit that caps other rock units in this area. We’re slowly picking our way across the rugged cap-rock of Zabriskie Plateau. Over the weekend we drove 23.4 m while also managing to use every single instrument on the rover! For the Sol 696 plan we will be doing two quick APXS integrations on targets Wildrose and Surprise, along with documentation images. We’ll also be taking a Mastcam multispectral observation of Mahogany Flats and a right-eye image of the target Jangle. Multispectral observations involve taking pictures of a target with various filters in front of the camera. This results in a low-resolution spectrum for each pixel in the image, which can be used to figure out (very approximately) what type of minerals are present, and to pull out detail that would not be visible with an ordinary red-green-blue image. Once the science is done in the sol 696 plan, we will drive again. A MAHLI photo of the holey left middle wheel of Curiosity on sol 695, while the rover was atop the Zabriskie plateau. The puncture near the far right edge of the middle wheel (from the point of view of the viewer) was not there 30 sols previously. I am a little confused on the reporting of the wheel wear. On one hand, we hear JPL saying it's OK, we expected this, the thin aluminum isn't needed. But we also hear about a tiger team running studies on scarecrow, the driving team finding less rocky routes, and every new hole in a wheel reported via the media. So, is it just the press making it worse than it really is, or are we just being excessively safe, or something else? Is there not a common consensus regarding how bad this is for the mission? By the way, thanks for the AWESOME report! That's a fair question, and it's probably about time I wrote a post specifically about the wheels. Bottom line: they expected wheel damage. They didn't expect it to happen this fast, so now they have to work to reduce rate to what they expected by finding better terrain. Even seriously damaged wheels will work as wheels, but they want to put off serious damage as long as possible. Thank you very much! That would make for an interesting blog post. Last week I heard a 1 hour talk about the wear of the wheels during the Mars 8 conference. The nice video of the "impaler" shredding a wheel was very impressive and showed that during the calculation for the wheels the force which can be produced when the rover is moving forward and encountering an obstacle is much larger than the force created by the rover standing on the same obstacle. This made the leading wheels the hot spots for damage. The tailing ones are much less effected. They are now categorizing the train from orbit images and try to stay on blue and green areas and avoiding orange and red ones. The tour through the hidden valley will be most on sand and they categorize this as blue and green. The point at the end will be a short red tour. The way up the hill might be rougher, but this is where they want to go and it is necessary for their science. The way to the entering point is only necessary and should not cost too much (paid in wear). The way forward and how they plan makes it look like they do not plan for an early end of the mission within the next two to five Mars years. In light of these problems, is a wheel redesign being considered for the Mars 2020 rover? Is it just me or do others feel this mission has'nt achieved all that much "all show & no Go" so much was promised many billions spent & for what? Are we using our space funding in the most efficient way? 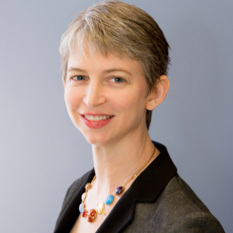 it's a question that needs to be asked as other program's have been cancelled in order to fund missions like this, it has occurred to me that right from the beginning poor planning & decision making has led to such a lack of any true meaningful scientific data. The wheel wear problems were not "expected" otherwise it wouldn't be such a problem at this stage of the mission, in any case it seems a good analogy for the mission so far.